Growing irrigated area & high water demand Since 2010, China has become the country with the largest irrigated area and in 2015, its irrigated areas reached 66.1 mn hectares. This is more than 3x the size of irrigated areas in the US (20.2 mn hectares). 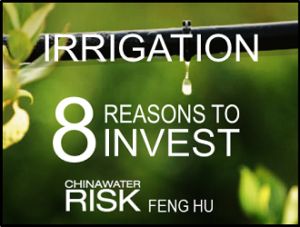 Plus, irrigation is the largest water user in China. As of 2013, China’s total irrigation water use stood at 340 bn m3. This is equivalent to the average annual flow of the Pearl River, China’s third longest river. Water use per hectare declining but still lags the US Average water use per hectare of irrigated land fell from 6,750m3/ha to 5,700m3/ha in 2004-2016 (see chart adjacent) but this is still nearly a quarter more than the US average. More efficient irrigation needs investment Reaching the 13FYP targets set out above needs up to RMB 127.9bn. Since 12FYP, China has already been promoting agriculture water-saving projects in four key regions: Northeast China, North China Plain, Northwest China and South, investing >RMB139 billion to equip 7.5mn hectare of farmland with highly efficient water-saving irrigation by 2017/2018. See charts below for estimated investments for respective water-saving measures.